Les Graham F.A.I.H.A. is one of Australia’s top landscape artists in oil. He also works in other mediums such as watercolours, pencil and charcoal, and has made several cold bronze statues. Les Graham’s paintings are now in important collections in Australia and throughout the world. They hang in the homes of Royal families, film stars, politicians, professional and private people. They hang in foreign embassies, boardrooms and galleries. In 1979 he donated a large collection of his work to the townspeople of Kempsey which now hangs in perpetuity in the Civic Centre. He has won many awards, published two books and written many articles on art and has been made a Fellow of the Australian Institute of History and Arts. 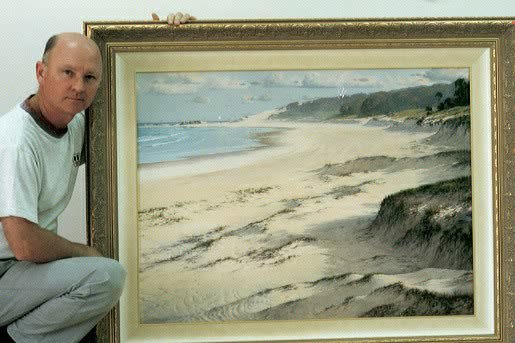 Les with a painting of "THE DUNES". The passion for his craft is clearly evident in his works.